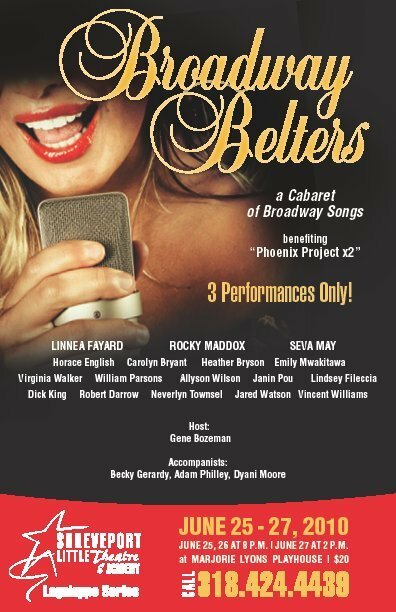 Shreveport Little Theatre box office opens June 7 for Broadway Belters: A Cabaret of Broadway Songs. This event is a fundraiser for the Phoenix Project x2 to complete the interior construction of the backstage of the theatre, which was completely destroyed by fire in 2008. Performances are scheduled for June 25, 26 at 8 p.m. and June 27 at 2 p.m. at Marjorie Lyons Playhouse on the Centenary College campus. All Tickets are $20. SLT Box Office is located at 300 Ockley Drive and is open weekdays, noon – 4 p.m., 424-4439.
looks like this is going to be a great show. get out and get your tickets this week. i did.